The question of the use of the words "wear" or "dress" is one of the most popular in the school course of Russian language. These words are similar not only in sound but also in meaning but used in different situations. To wear – something. Synonyms of the word are: coating, push, pull anything. For example, wear a mask, coat, dress, skirt, suit and so on. That is, this verb is used only if we are talking about what someone else wears something inanimate. To wear – one that. The main synonym to clothe. As you can see, the context is directed at an animate object, that is, to wear someone. For example, dress the girl, boy, children, the wounded. Can also use inanimate objects, if we are talking about what they wear in clothes. For example, dress a mannequin or a doll. Differences also lie in the various antonymy pairs, i.e., these words can not pick up the same antonyms. For the word "wear" the antonym would be the word "remove", and "dress" – "to undress". The use of a particular verb depends on the situation. 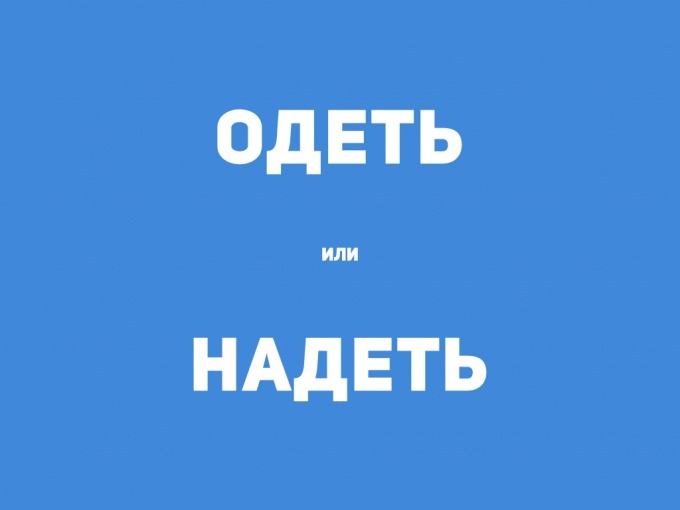 In colloquial Russian, this difference is not so noticeable, but if you plan to take the exam or quiz on the Russian language, the ignorance of these rules will be considered a serious error.